There is no <i> (or any letter) on any remote I have. This should be able to be invoked as a visual info button via song OSD if it is to be useful. (2018-10-23, 09:11)HeresJohnny Wrote: There is no <i> (or any letter) on any remote I have. This should be able to be invoked as a visual info button via song OSD if it is to be useful. Bit off topic, but I occasionally get confused when people post keyboard presses as I only ever use remotes too. However, my Lircmap.xml maps a key named Disp on my remote to the Info action, which is the same thing as pressing <i>. I guess part of this is knowing that you can call up different windows or info screens by pressing something, be it keyboard or remote or whatever. For the person that's skinned it, this is obvious, for the average user, I'd suggest much less so. EG, I wasn't aware of the song information dialog that @scott967 mentioned. Radio helper gets track info when it's available but currently I'm not using it. That dialog might be a good place to display it. In the mod I did of Estuary, only fanart is shown if you toggle that boolean off, everything else vanishes. I think in AeonMQ, the only view like that is if you switch to the 'karaoke' view otherwise as you say, covers, cdart etc are always displayed. To activate map remote button to ActivateWindow(SongInformation) or then as suggested an additional button can be placed in OSD (as a crude example I used an existing Confluence icon for i). for which to display for whether you are in Visualisation window or not. Yup, an info button like in that mock-up would be purrrrfect! Meow! For all posters, yes I typically refer to keyboard keymap in skin development, and I recommend reviewing keyboard.xml to see what actions are mapped to keys. The info action is a pretty important one. On Music Viz window, I'm just throwing it out there as an alternative kind of info view that could be used in a different way from song info, though I guess it could be confusing to users. 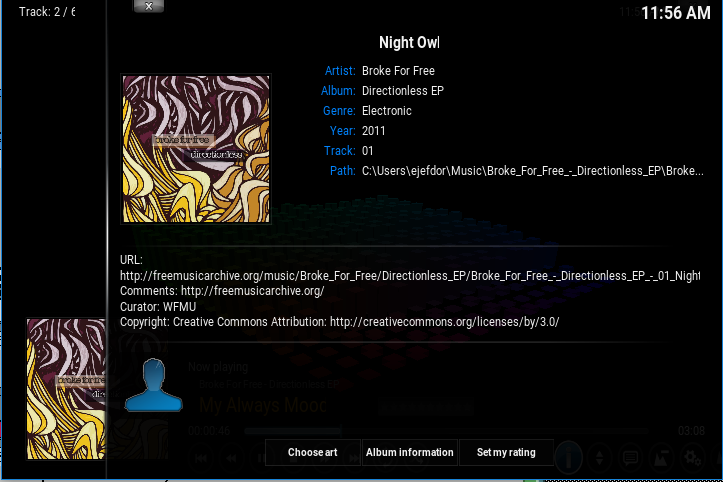 On Aeon MQ5 currently user can get to songinfo from the OSD menu in music viz (click - scroll - click). I was using the "other" info to show role information but it isn't ATM a very "rich" experience. That's why I'm open to ideas on what could be put in there. @HeresJohnny , try Aeon MQ7 Mod., if you haven't already found it. The earning curve is pretty steep to customize as you like, but well worth the effort. My Mod is getting a bit diverged from the main Estuary skin now, so it might also be a bit of work. Just wondering if you were going to look at that side of things or should I? Song info dialog was on my todo list as that returns nothing at the moment, I hadn't really looked into the other dialogs yet as Confluence is still my skin of choice mainly due to Estuary lacking some of the niceties for music that Confluence has. My aim is as a bare minimum to get parity of the information displayed between Confluence and Estuary, however while doing that I'll see if there's scope for additions to either. I just looked at 325600 (thread) and I don't see any posting from you about what you've done with Album info dialog. My addon gets Album information and review from tadb (thanks docwra/zag for an awesome source of info) but currently doesn't display it anywhere. 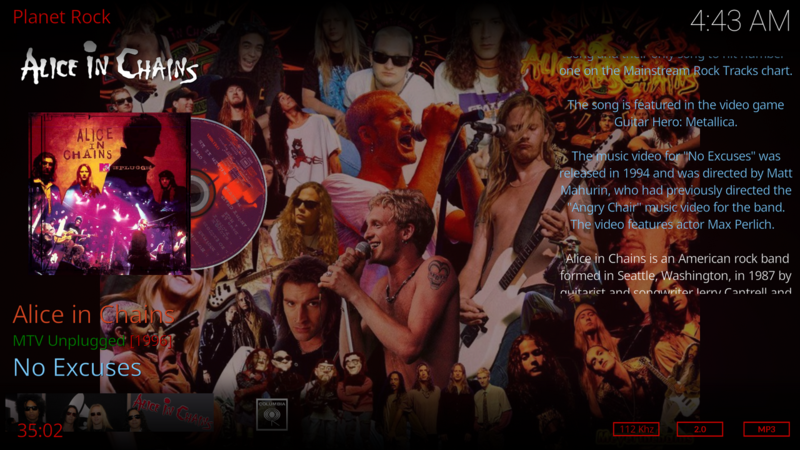 The main screen already contains enough info I feel so I'm wanting to do a similar thing to jjd and be able to pull up a dialog with the album info/review in it. 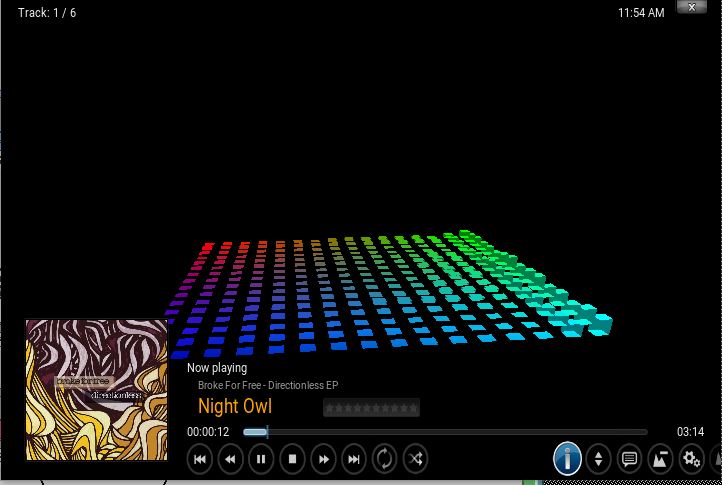 BTW, that screenshot is of a track playing on a streamed radio station. Album art, cd-art, logo, banner, record label and track info (on the right in light blue) all supplied/scraped by theAudioDB. Fanart and band info (in white on the right) supplied by ArtistSlideshow. Wife listens to radio a lot and we can't turn the tv off in the kitchen as there is no external amp for audio in there so it might as well look good eh ? Yeah, fully understand why Estuary can't have any extra addons bundled with it. 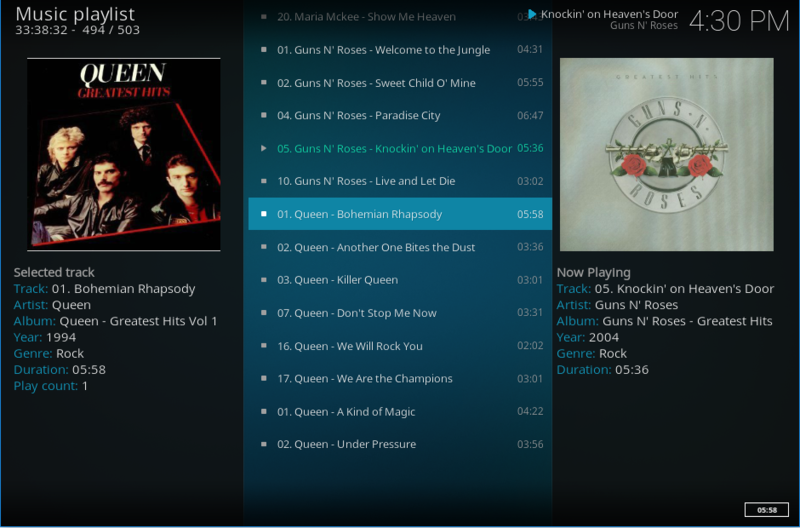 Just want to put it out there that my addon can make streaming radio look as good as a locally played track. 90% of the info comes from tadb with the rest from fanart.tv and/or last.fm . Now works pretty well and has been running on three Kodi instances of mine for 6 months without any issues. The mods to Estuary could probably be improved (size-wise and location) but overall it does what I want it to do right now. NOTE : This isn't an album in my local collection, but the helper makes it appear as if it is !! Great, will try this soon! Do you have pkscout's mod as a tracking branch? I think he fixed a few bugs and updated to latest Estuary in the meantime. (2018-12-01, 05:35)HeresJohnny Wrote: Great, will try this soon! Do you have pkscout's mod as a tracking branch? I think he fixed a few bugs and updated to latest Estuary in the meantime. Now done !! Github skin has been updated to include all the latest changes from pkscout's master branch.